"As the proverb says, better to return as a ghost than never at all." "The first step in the writing process is to understand the assignment. This may surprise you if you have never thought about the variety of writing assignments you may encounter." Here's a link to our guest blog diagram over at DJ Misc, showing how diamonds throw out miniature northern lights. In our book on Divination by Punctuation, we note this marvelous take on the hyphen by the great scholar of anomalies, Charles Fort: "We have to get along with the logical-illogical, in our existence of the hyphen. Everything that is said to be logical is somewhere out of agreement with something, and everything that is said to be illogical is somewhere in agreement with something. . . . In an existence of the hyphen, it is impossible to be altogether wrong—or right" (Wild Talents, 1932). Is this a hyphen trapped in time? A page emblazed with the words "This page intentionally left blank" is hilarious to folks blessed with the ability to comprehend irony (recall our previous post in which a person with irony-challenges proudly stepped out from under a rock, discordance be damned!). But we surely approve of working a hyphen into such ironically non-blank pages. Speaking of irony, we're reminded of a great line in the classic comedy series Black Adder: "'Have you no idea what 'irony is?' 'Yeah, it's like goldy and bronzy, only it's made of iron." Why waste your time in a living hell? You can live in cloudland just as well. Portrait from Memoir of Rev. James M. Challiss. The manifesto manifesto, by Kim Mok. "The surprising truth, that life over there is much the same as life over here." "Writing is just a version of reading."
. . . which reminds us of Hemingway's description of "eyes like inkwells." We have a new book out for magicians and magic enthusiasts — a guide to the hidden gems of the classic magazine The Jinx (1934-42), entitled Jinx Companion. See it online for free at our Jinx Companion page. "Rhetoric, as hardly bears repeating, bears only a distant relationship to truth." —Wlad Godzich, "The Domestication of Derrida"
Don't look a sugar daddy in the teeth. "The only certainty is risk." "Surprising though it may sound, some of the splendour of the inaccessible realms above can be found even here." "Faint songs visited my ears, and the gray day was only gray like a dove's breast." Portrait from A Memoir of Charles Mayne Young. Here's our guest tweet over at the traffic light on Michigan Avenue. "Our only certainty may be that we feel uncertain about our future." If a traffic light hangs at an intersection and there's no one there to see it, does it see red? Our favorite virtual traffic light answers this question here. Kudos to Gary Barwin for this Googlewhack: "Metaphor, it's really something else!" "This may surprise you — many people find that anger makes them feel good." "Don't take this the wrong way, but if I feel tomorrow like I do right now, I might be better off hanging out with myself." Portrait from The Best of Balzac. We're honored to illustrate an article about L.A.'s mysterious public gardens. 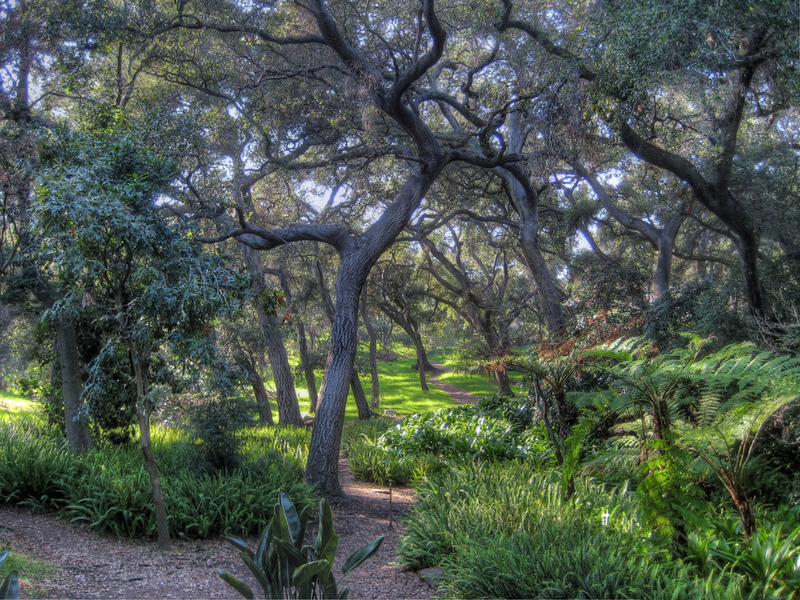 Our photo depicts the beautiful Descanso Gardens. We can verify that p'fft is an appropriate response to "blankety-blank nonsense" (as noted on the first page of Budget Weddings For Dummies). Relatedly, Wodehouse has written: "He had a dim sort of idea that it began with an F or a G, but beyond that his mind was a blank" (The Small Bachelor). But did you know that p'fft comes down to us from an ancient Chinese expression meaning, "May your children and grandchildren never murmur as they carry out the careful and brilliant virtue of their predecessors"? It's commonly assumed that the apostrophe in p'fft stands for an f, the concept being that an f-too-many is overwhelming. Indeed, Wodehouse notes: "You could have knocked me down with a f" (Right Ho, Jeeves). Yet the truth is more interesting. The apostrophe actually stands for a hyphen, swept upwards as it were by the breath of the expression. "The surprising truth is that Mom can also read your mind when you are fast asleep." There's something beautiful that children don't learn in books of fairy tales. In surrealist novels for grownups, the illustrations don't necessarily correspond to the text. For example, in the dreamily Gothic Czech masterpiece Valerie and Her Week of Wonders, the illustration of a headless woman for page 149 appears next to page 106. Prof. Oddfellow explains the phenomenon by way of Philip G. Zimbardo's Discontinuity Theory, which suggests that cognitive searches for rationality and normality may lead to madness. "The only certainty that we have is that we are not alone." *To learn what an asterisk means in a tea leaf reading, see Dr. Boli. Photo by Scout Seventeen, slightly modified. "This may come as a surprise, but I don't spend a lot of time checking out your wife's breasts." 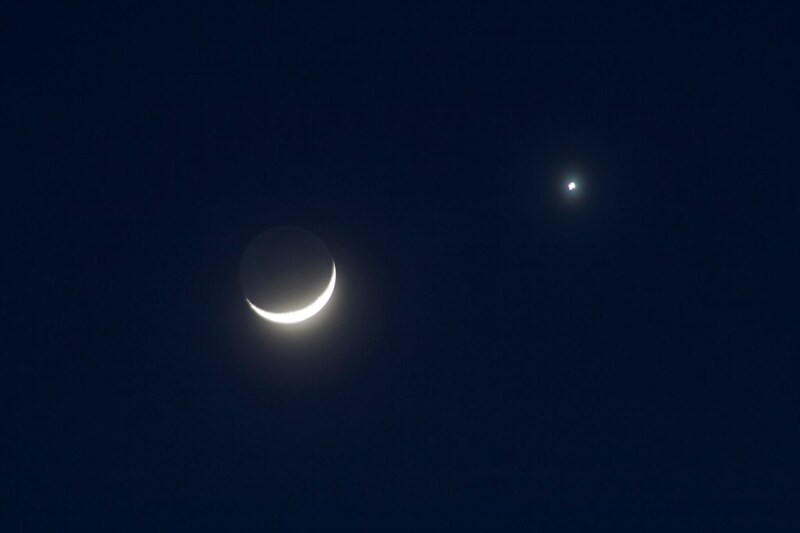 A Moon / Venus semicolon, captured by Greg. Here's an insightful review of an unusual, gutted book that cannot exist digitally. Portrait from Memoir of the Life of Elizabeth Fry. "The [computer] link will turn out to be the most important new punctuation mark since the comma." "This may surprise you. ... Writing is work — hard work." "Calling it a hunch just makes it mysterious, and it isn't." Gordon spotted our Not Rocket Science at Chicago's Quimby's Bookstore, sitting next to All My Friends Are Dead. The pairing is apropos, for our book was inspired by the illustrious Martha Brockenbrough, author of The Dinosaur Tooth Fairy (Arthur A. Levine Books). Which car is funnier: Buick or Chevrolet? Portrait from Memoir of Albert Newsam. "For nutritional quality, the surprising truth is that most tomatoes are created equal after all." A massive and truly amazing tour de force of linguistic dexterity, merging sorcery, etymology, history, and literature into a global cascade of words of power magical and otherwise, drawn from countless ancient and modern civilizations. The art of Grammarye meets literary erudition, with each word examined, explained, and illuminated by wild and witty quotations from countless sources. Spells, mantras and Qabala meet slang, hokum and poetry. Enormous fun, and about thirty pages devoted to aspects of Abracadabra and its variants alone! Big fun! Hours of creative playtime! "The act of reading impedes looking at words." "This may come as a surprise, but some of the things you do to relax can actually make you more stressed!" —Trevor Romain, Stress Can Really Get on Your Nerves! 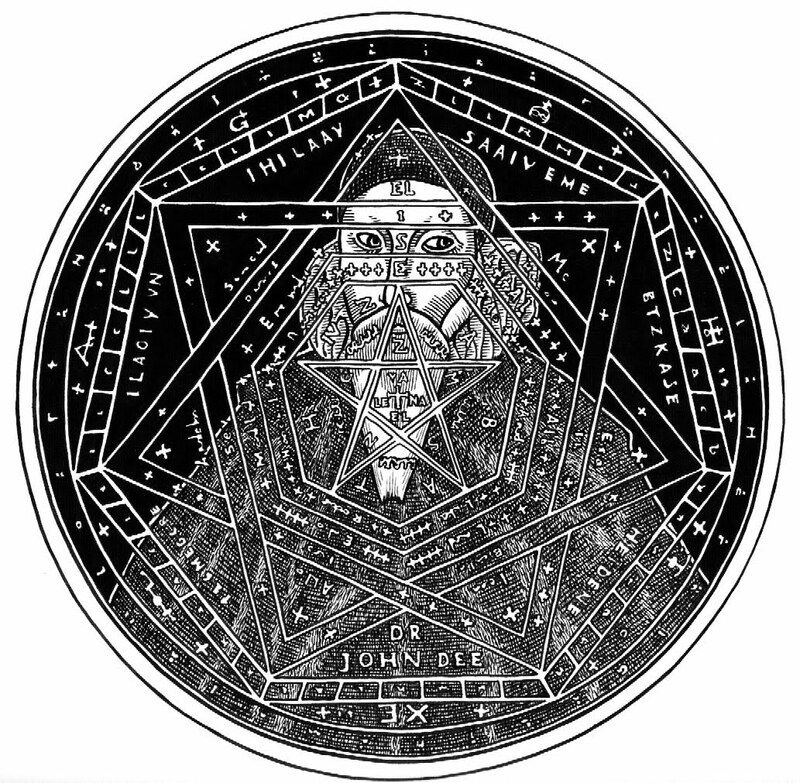 Our 9th cousin, the visionary Dr. John Dee (adviser and tutor to Queen Elizabeth I) is here beautifully celebrated by the artist Sev. Portrait from Life of Johnson. Paddling in school is controversial. Yet how will students row, row, row their boats gently down the stream without a paddle? "The surprising truth about performance evaluation is that it rarely works and is almost universally disliked by leaders and followers." "I want more than what I want." "Language only works when two or more people agree that it does." "Why didn't you tell me in the map room there was a map missing?" Portrait from Autobiography of Andrew Somerville. The following passage from Robert Irwin's astonishingly brilliant The Arabian Nightmare, in which a character traverses a chessboard-like Cairo, recalls our own manual on using a game of chess to construct a story: If A Chessman Were A Word: A Chess-Calvino Dictionary. Crossing the open spaces of the city was like moving across a chess board, chill and dark in the shadows, still brilliantly warm in the places the sun could reach. He was crossing a dark square now near the Bab al-Luq, where the rich merchants' houses were, when he saw a face, high up in the dark shadows of an upper-storey casement, staring down at him. It was a woman's face, round and plump and shining silver as if it was the moon. Deliciously, the character in Irwin's novel is about to confront a knight! "This may surprise you, but the best place to meet a flight attendant is not in the air, but on the ground." "The & is a possibility." "Our only certainty is that dissonance is a source of motivation." Our friend Teresa at Frog Blog posts about the fine line between giving up and seeing how much more one can take. "I know this may come as a surprise, but it turns out that refrigeration actually dries out its contents." "'Life insurance': a pretense that it is a soothing and useful event to have a violent and painful death." Portrait from A Memoir of the Life of William Livingston. Did you hear about the stage magician who toyed with yoga? 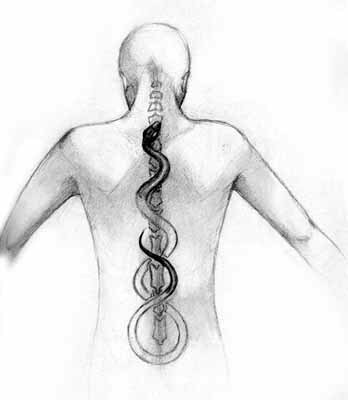 His kundalini rose as a balloon snake. "Even liquids may be magnetic. This may surprise you, but you can easily prove it to your own satisfaction." We've previously noted that even a squiggle isn’t immune to the corruption inherent in transliteration. Here's our newly updated pictorial study of how Laurence Sterne's elegant and eloquent squiggle (d)evolved through various editions of Tristram Shandy. We call it "Lost in Transliteration." We're proud to be the only place on the Internet that compares Dutch, French, Spanish, German, and English squiggles from literature. Portrait from John Greenleaf Whittier. "The surprising truth is that an ancient Roman would probably not have known how to decipher any of [the Roman numerals]." Here's a guessing game. How many pages did a reader make it through Metaphysics of the Supernatural as Illustrated by Decartes before scrawling an expletive in the margin? There are 65 pages, so your guess should be from 1 to 65. To reveal the bad word in question as well as the correct page number, click the image below. Which is funnier: last year's fashions or last century's? Clue: This is according to playwright Arthur Wing Pinero.